September 26, 2012 Vancouver, Canada -- El Niño Ventures Inc. ("ELN" and the "Company") (TSX.V: ELN; Frankfurt: E7QN; OTCQX: ELNOF) is pleased to announce that it is retaining the services of Renmark Financial Communications Inc. to enhance and increase its existing investor relations activities. Renmark will focus on increasing visibility of El Nino Ventures in the retail investment community. "We are pleased to announce that we have selected Renmark to reinforce El Niño Ventures Inc.'s profile in the financial community and enhance the visibility of our project portfolio. We choose Renmark because its standards and methodologies fit best with the message we wish to communicate to the investing public," noted Harry Barr, Chairman and CEO of El Niño Ventures Inc. In consideration of the services to be provided, El Niño Ventures Inc. has agreed to a monthly agreement with a monthly retainer of $7,000 with a 3-month out clause to Renmark Financial Communications Inc.
Renmark Financial Communications Inc. does not have any interest, directly or indirectly, in El Niño Ventures Inc. or its securities, or any right or intent to acquire such an interest. El Niño Ventures Inc. is an international exploration and development company, focused on exploring for zinc, copper, silver, gold and lead in New Brunswick, Canada and copper/cobalt in the Democratic Republic of Congo ("DRC"). Consists of an initial 4,712 claims in the tri-party agreement with Xstrata Zinc Canada & Votorantim Metals Canada ("VM Canada") (wholly owned subsidiary of Votorantim Metais, the 2nd largest mining company in Brazil) whereby VM Canada may incur exploration expenditures of $10 million over a period of 5 years to earn a 50% interest. VM Canada may further increase its interest to 70% by spending an additional $10 million over 2 years. The 2012 exploration program, funded entirely by Votorantim, consists of approx. 12,000 metres of drilling on select targets. The program also included airborne and ground geophysics. ELN to elect to participate in any new acquisitions within the area of interest. In September 2012 VM Canada, as the operator of the BOJV agreement, contracted Diagnos Inc. of Brossard, Quebec to complete a comprehensive study utilizing their proprietary software (see Diagnos TSX.V: ADK press release dated September 18) that will identify areas (within the area of interest) with high statistical probability of containing mineralization. 2. Murray Brook Polymetallic Project - Bathurst, N.B. The Murray Brook acquisition for ELN was a direct result of the Area of Interest clause in the BOJV agreement, as outlined previously. Murray Brook is a polymetallic, massive sulphide deposit, and is currently under evaluation for the development potential of an open pit mine. 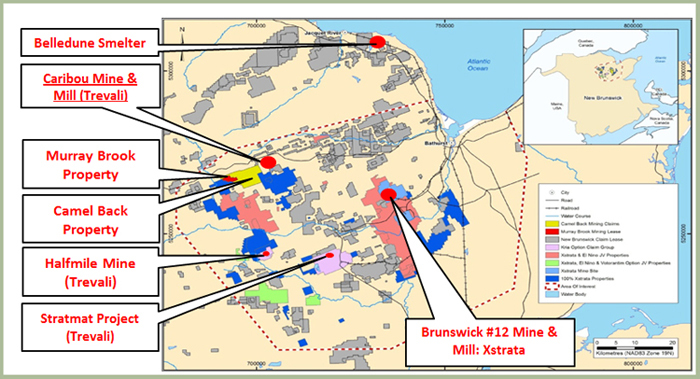 Historically, the deposit was the fifth largest in the Bathurst Mining Camp and is under option to VM and ELN from Murray Brook Minerals (MBM) and Murray Brook Resources (MBR). The Murray Brook project is located 60 km west of Bathurst. It is supported by excellent infrastructure, including paved roads, grid electricity and communities to provide goods, services and skilled labour (Figure 1). To date, more than 28,000 metres of drilling has been completed with encouraging results. In February 2012, an NI 43-101 resource estimation was announced (see news release). The technical report is filed on SEDAR.com and also available on ELN's website. An updated NI 43-101 is slated for release by the end of 2012 and will include the results of the 18,500 metre drill program. Plans are to complete a Preliminary Economic Assessment (PEA) by the end of the first quarter of 2013. Although the terms of the agreement with VM Canada, ELN, MBM and MBR provided for a three-year period to earn the initial 50% and two years to earn the additional 20%, VMC and ELN completed their 70% earn-in in less than 18 months. Encouraging drill results and a very positive NI 43-101 resource estimation accelerated the exploration and development programs and is a testament to both ELN and Votorantim's commitment to aggressively advancing the project (see ELN press releases dated: May 17, June 5, June 27, July 17, July 30, August 14 and August 28, 2012). Under a purchase agreement signed by VMC on August 28, 2012 with MBM and MBR., VM Canada acquired the right to purchase the additional 30% of the Murray Brook Project. ELN has been provided the option to earn an additional 15% in the project for a combined total of 50% (35% +15%). Metallurgical test-work of bulk sample material from the Murray Brook deposit is currently underway at RPC Laboratories (Fredericton, New Brunswick). Under the direction of Votorantim Metals Canada Inc., operators of the Murray Brook Project, three holes were drilled to provide sample materials for metallurgical tests. The test-work is focused on determining potential metal recoveries based on a recommended metals recovery process flowsheet which, subsequently, will form the basis for a small scale metallurgical pilot plant program. Metallurgical results, along with a revised resource estimate will incorporate 2012 drill results, and will form the basis of a Preliminary Economic Assessment study to be completed in Q1 2013. Phase 2 of Metallurgical studies (Pilot Plant), Preliminary Economic Assessment Studies, Geotechnical drilling, detailed delineation of base of oxidation and Environmental assessment studies are slated for 2013. Subject to continued positive results, the companies plan to complete a pre-feasibility study and a feasibility study by 2015. The Kasala Copper/Cobalt project is located in the Democratic Republic of Congo's Central African Copper Belt, approximately 16 miles from Minmetals Mining Resources' Kinsevere Mine (formerly owned by Anvil Mining). Anvil Mining was recently purchased by Minmetals Mining Resources for $1.3 billion. Drilling has intercepted of up to 23 metres grading 3.28% Cu on the Kasala project. The project is currently under Force Majeure pending outcome of arbitration in British Columbia and litigation in the DRC.